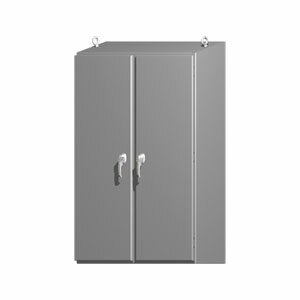 NEMA 4X 304SS Slope Top Washdown Enclosure, Chemical Resistant Electrical Enclosures, sizes 60x48 to 72x72"
The SCE-2DST Series 304 SS electrical enclosure and control panel is designed to house electrical and electronic controls, instruments and equipment in areas which may be regularly hosed down or are in very wet conditions. The 15º slope top on these enclosures and control panels provide protection from dust, dirt, oil and strong jets of water. This indoor/outdoor electrical control panel is the solution for weatherproof applications and use in corrosive environments. Finish: #4 brushed finish on all exterior surfaces. Optional panels are powder coated white. Nema 4 stainless steel electrical enclosure 60x48x12"
Nema 4 stainless steel electrical enclosure 60x48x18"
Nema 4 stainless steel electrical enclosure 60x60x12"
Nema 4 stainless steel electrical enclosure 60x60x18"
Nema 4 stainless steel electrical enclosure 72x60x12"
Nema 4 stainless steel electrical enclosure 72x60x18"
Nema 4 stainless steel electrical enclosure 72x72x12"
Nema 4 stainless steel electrical enclosure 72x72x18"
Nema 4 stainless steel electrical enclosure 72x72x24"
NEMA 4X 304SS Slope Top Washdown Enclosures, Chemical Resistant Wall Mount Electrical Enclosures, sizes 16x12 to 60x36"